Hi Everyone! 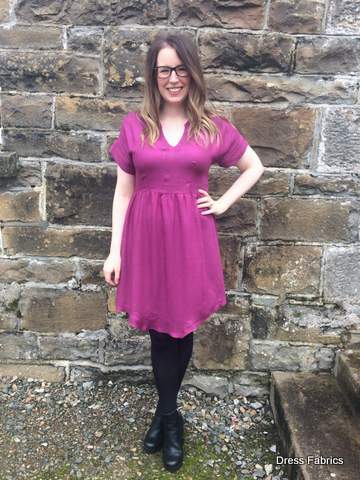 Charlotte (@charlottewhincup) here to chat about my make for the Dress Fabrics Blog. Firstly, a wee bit of background info about myself. I started sewing about six years ago when I changed jobs to work in a tweed mill and it was from there that I’ve started trying to sewing my own clothes for around the past three years. 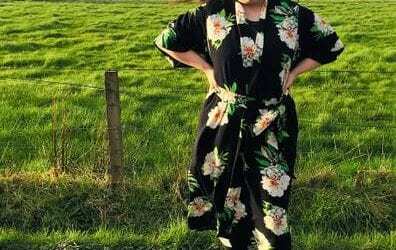 I get a great buzz when someone compliments a dress or jumper that I’ve made myself – it’s so rewarding! 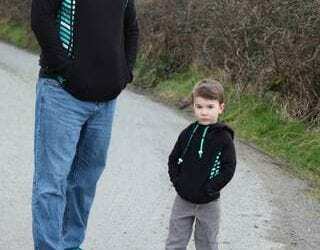 I blog at Professional Stitch Ripper but am currently on a bit of a hiatus due to the arrival of my wee fella. 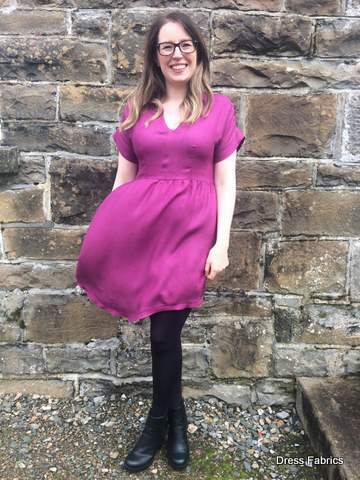 I’m delighted to be part of Dress Fabrics Blogging Team so I can write the occasional blog post and still be involved in the sewing community! Onto the important stuff. I chose the Chalk and Notch Fringe dress pattern as I knew I wanted a comfortable but stylish dress for my return from maternity leave to the dreaded work environment again. This is my second time making the Fringe pattern (I made the top previously) and it’s such a fun and quite simple pattern. The instructions are great and very straight forward, it’s a good choice for an advanced beginner. 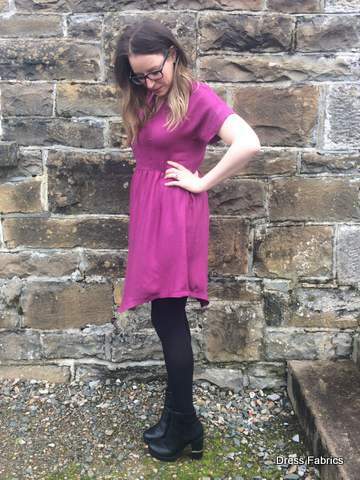 I made Version B with no alterations (with the exception of shortening the hem by about and inch and a half) and used just less than 1.9 meters. I wanted a colourful fabric that drapes nicely and I chose the Viscose Twill in Fuchsia. 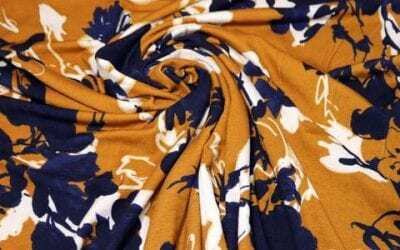 If you’re unsure what viscose is, Maeve has a great blog post explaining all the different types of viscose fabric available. The viscose twill has a beautiful feel to it and has that lovely drape that you would expect from any viscose fabric. I prewashed the fabric and there was very little, if any, shrinkage. As for cutting, it’s a slippery devil. It was the first time I had used a rotarty cutter and mat and it seemed to work wonders. Place pattern piece, throw on some weights and away you go. If cutting with scissors, I’d recommend using lots of pins to minimise any slippage whilst cutting. I had sewn with the good old regular viscose before but never with a viscose twill. Because of the twill, it makes is much easier to distort the fabric while sewing. For example, shoulder seams may become stretched out. I would suggest using a lot of pins before even starting to sew. Feed or ease the fabric into your sewing machine while sewing rather than holding your fabric taught as to not stretch out your seams. That coupled with lots of pins and everything should come out perfect! As for finishing seams, an overlocker would be a great finish as the viscose twill frays quite a bit. Any method of finishing that results in the seam being encased is good. Basically, pinking shears or a zig zag stitch won’t cut it here. I used a regular needle on a basic sewing machine. 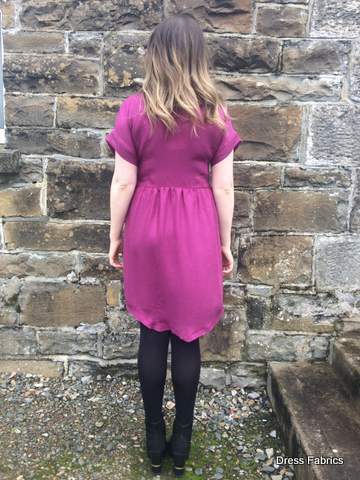 I don’t have an overlocker so I finished my Fringe dress using French seams throughout (which was a task seeing as the seam allowance was 1cm). When sewing up my Fringe dress, I didn’t use any iron on fusible (stabiliser) around the neck even though the pattern specified it. I’m not the biggest fan of fusible but I would recommend using the lightest fusible you can find for around the neck and even for the edge of the sleeve cuffs (possibly for the shoulder seams if you’re slightly heavy handed with handling your fabric). Just to make it a bit easier when top stitching and by using a light fusible, the drape of the fabric won’t be spoiled. The fabric itself is quite warm even though it’s really lightweight. My fringe will be nice with tights in colder weather and also as a summer dress in Ireland. The colour is Fuchsia and is only €8 per meter which I thought was great value as the quality of the fabric is second to none. If you’ve only got a meter or so of lovely viscose twill, a Grainline Scout Tee or True Bias Ogden Cami would be good contenders. Good fabric, good price, a little bit tricky to handle but otherwise it’s definitely a winner. Big thanks to Maeve at Dress Fabrics HQ for the wonderful fabric! 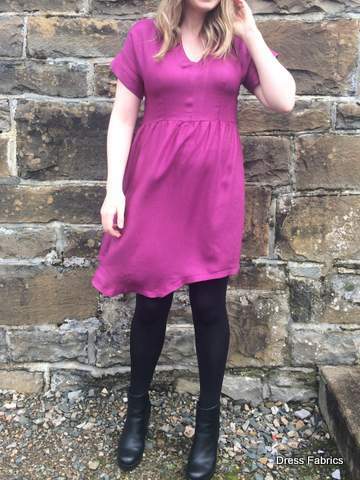 Thanks for your lovely post Charlotte – fair play to you for doing those french seams with a 1cm seam allowance. Enjoy wearing your fab dress. We have lots of viscose fabrics in stock right now – perfect for dresses and tops for our spring & summer.